Organised and very approachable, Chantelle is a great communicator who loves working with people and building client relationships. Chantelle is passionate about her role in the Newton Team as our Property & Tenant Services Officer she prides herself on her local knowledge. 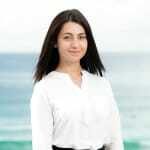 Chantelle’s energetic nature makes her a great fit for our dynamic and hardworking property management team. Data is based on information advertised in the public domain or supplied direct by real estate agents to homely.com.au and may not contain off-market, private sales or non-disclosed prices. Chantelle Maksoud doesn’t currently have any leased properties on Homely.